The Milwaukee Business Journal presented OVL with the Fastest Growing Firms award for 2018. OVL was presented with the State of Wisconsin Governor’s Export Achievement Award 2018 by the Wisconsin Economic Development Corporation (WEDC). Click view to watch our video! 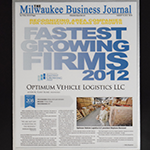 The Milwaukee Business Journal presented OVL with the Fastest Growing Firms award for 2012, 2013 and 2014. 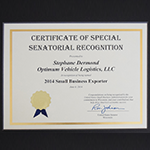 OVL and Stephane Dermond were awarded Small Business Exporter of the year in 2014. The Future 50 Program recognizes privately-owned companies that have been in business for at least three years and have shown significant revenue and employment growth. 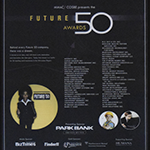 The Future 50 award is presented by the Metropolitan Milwaukee Association of Commerce (MMAC) and Council of Small Business Executives (COSBE). OVL received this award in 2011, 2012 and 2013.